Real-time job tracking helps you react to all the issues that happen in the field that you don’t know about, instantly! On the admin system, we have a live panel that most of our clients have on a TV or PC in the office. This enables you to see when jobs overrun, can’t get access or simply haven’t started yet, so you can make quick work of administration tasks when it comes to booking in jobs or simply just keeping a track of them and making sure they are done properly. 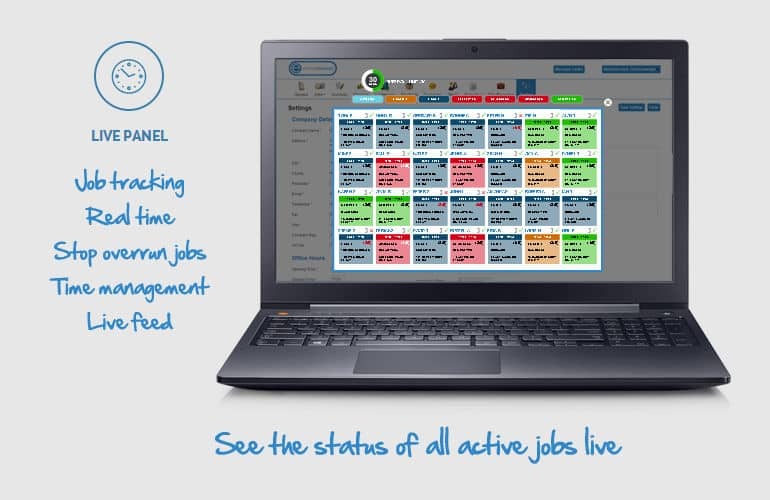 Using the live panel enables you to react and manage the jobs that are having issues with. Knowing where your staff are and what they are doing is a managerial skill when they are working out of the office, with Eworks Manager it's built in! This will reduce time spent on the phone to your operatives, asking them where they are and what they’re up to, as you will be able to see live and track all other future and past jobs done by your operatives! You can even create a questionnaire for certain jobs for your customers to complete of once a job has been completed, so you can receive the feedback you need. Unlike most Job Management Software’s out there, we provide constant support to all our customers, whether you have a quick question, require some more training on the admin system or the app or require a bespoke to change, we are always here to help with our super friendly customer service team and 24/7 support email. Eworks Manager offers many company benefits and above is just one feature so if you’re ready to ditch the paperwork and start your Eworks journey, sign up for your 14-day FREE trial and try it out for yourself! If you would like to get in touch and discuss our job tracking further and why we think it could benefit your business, please feel free to call our office directly or pop us over an email, we would love to chat and book in a free online demonstration of the software, so you can see why we are the leading Job Management Software for yourself!